This is a continuation of the Part 1 post where we had just started climbing to the top of the fort and stopped a few times along the way to show you the sights. In part 2 we have made it to the top of the fort, and all we need to do is go to the top of the building on top of the hill! From the top you might certainly think of yourself as king! One of the most important features of the fort is its acoustics. The construction of the fort is such that any sound made at the entrance can be heard throughout the hill on which the fort stands. No sneak attacks! In the first post I mentioned the outer wall and moat. However, after the outer wall it has also a double wall that runs around the foot of the hill where the citadel stands. Looking at the top most left area of the map above is where we have arrived, Darbar Hall. I took a few videos of the view from the top of Darbar Hall. From here you could also see the entire layout of the fort and where the cannons had been placed for the protection of the fort. Golconda Fort - At the Top from Bhaga Video on Vimeo. A few more scenes from the top before we head back down to ground level. Darbar Hall was actually very cool inside compared to outside. 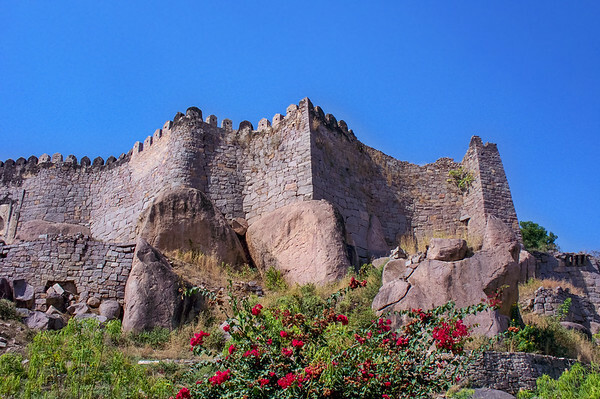 Golconda Fort - Enjoying the View from Bhaga Video on Vimeo. 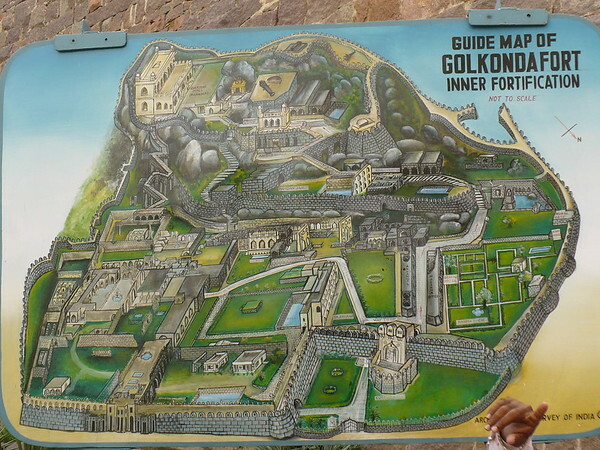 If you are in Hyderabad then Golconda Fort is definitely a stop you should make. There are a lot of steps to climb-up and then climb-down, so you will need to able to handle that. You will also want to have some bottled water with you before starting the trip, you can get pretty thirsty climbing all those stairs in the sun. If you go later in the afternoon there is a light show that takes place after dark, you might want to consider that when planning your visit. Look for Part 3 with a few videos and pictures that I took as we headed back down to the grounds below. Get out and see the world!